If you try, you won’t have much trouble finding a theater showing The Hobbit at 48 frames per second (most films are projected at 24 frames per second). It’s not the first time a faster frame rate has been attempted, and you may not like what you see. I first heard about “Showscan” in a college film class. 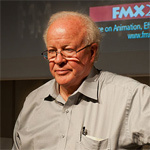 Professor Bruce Kawin was talking about special effects, the phi phenomenon, or maybe persistence of vision. He explained that Showscan was a process invented by Douglas Trumbull, a special effects designer who worked with Stanley Kubrick on 2001: A Space Odyssey. Showscan used 70mm film that was recorded and projected at 60 frames per second. The technical achievement deserves its own writeup, but for now let’s just acknowledge that it happened. I remember Kawin’s darkly ironic tone when he told us that we could still see this important cinematic milestone... at a rundown Chuck E. Cheese’s in Denver. We skipped the pizza but went for the show. We saw a short movie about streetboarding, shot from the point of view of a low-to-the-ground skateboard, complete with fans blowing wind in our faces and moving chairs vibrating us in time to the bumps of the asphalt. The atmosphere was not at all “cinematic,” and I have to say that the visual component wasn’t cinematic either. The detail was amazing, don’t get me wrong. But somehow the whole think looked like video. It looked like a cheap soap opera on TV. I didn’t like the hyper-realistic look of Showscan. Masterpiece Theater? Or TV in public? 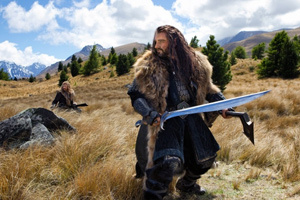 Last week I saw The Hobbit at 48 frames per second. It took me a long time to warm up to the look (maybe 90 minutes), and it took some effort of will on my part. My grandfather’s advice about being able to choose your attitude helped me embrace, rather than resist, the new look. On the other hand, I do have a preference, and for now it is 24fps over 48fps or 60fps. High frame rates are very literal, and that’s not what I like about the movies. On seeing dwarves wearing fancy costumes and actors in impressive makeup, one of my first thoughts was that this looked like Masterpiece Theater: expensive, high quality productions, but shot on video cameras. The best costumes, actors, and makeup couldn’t stop you from noticing that the medium was made for reporting, not transporting. My second thought was that Peter Jackson was going to acknowledge the new medium a la Laurence Olivier’s Henry V — that’s the film where the first scenes look like a filmed stage play, then the backdrops pull away to let the action continue in the much more cinematic “real world”. I hoped perhaps after the Smaug-gy prologue Jackson would somehow undo the “Masterpiece Theater-ness” of it. The prologue was a narrated storybook tale after all, and I hoped once we got to the main story, he would really wow us with how the new medium should really be used. But that didn’t happen. The medium is the medium. Film has a richness and texture, even a softness that is very different from the look of video and other high frame-rate mediums. (Video traditionally runs at 30 different frames per second, but replaced 60 times per second — two flashes per frame). 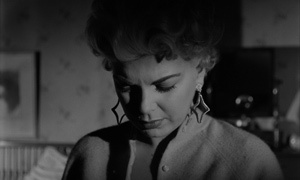 Look at the great films noirs and notice how the photographers paint with light. When I watch these films, I’m often taken by the dramatic composition, but I’m rarely distracted by how the shot might have been pulled off. With 48fps (in 3D no less) you don’t get textures; you get information. When Peter Jackson shows us an exterior of Bilbo’s Hobbit-hole at night, I don’t see a lovely composition “painted with light.” Instead I notice that there is an electric light in the bushes just to the left of the door, pointed up, and I think how odd it is that Middle Earth has electricity. Don’t even get me started on the lighting of the supposedly underground caverns. I think “magical” films will be harder to pull off in 48fps because I think it’s a more literal medium. Douglas Trumbull understood this. He directed a movie called Brainstorm, about a new technology that allows people to record and play back their experiences. He intended to use Showscan in in a very specific way. The film would be shot at 24fps, but the scenes of sensory-memory playback would be presented in Showscan. The device would offer its users an experience more real than real, and the audience would be in on it. If higher frame rates are too “real,” I wonder what someone like Werner Herzog or Errol Morris might do with this technology. It could be a natural fit for a fly-on-the-wall documentary, or some sort of Blair Witch / Paranormal Activity horror movie. I can see it working well with a martial arts movie to showcase an amazing stunt performer like Jackie Chan or Tony Jaa (but please not so much editing that I can’t see the stunts). If 48fps does turn out to be the wave of the future, I’ll try to take grandpa’s advice and have a better attitude. For now, I still prefer 24.